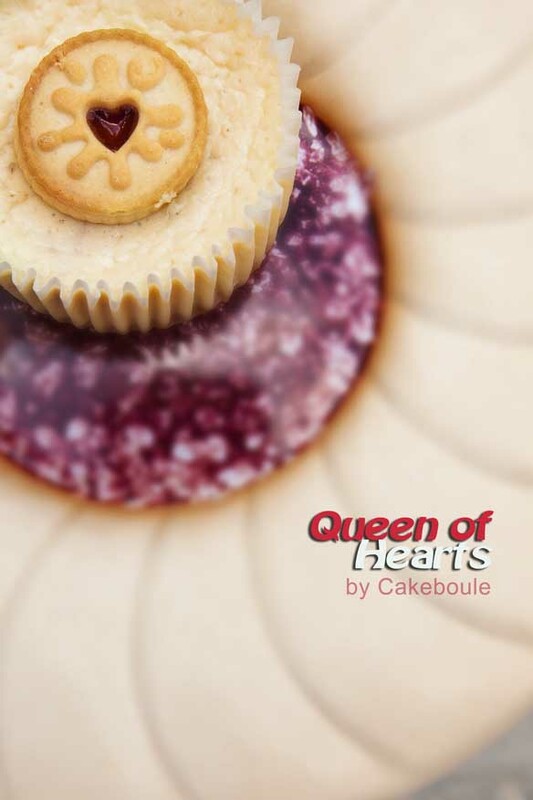 This entry was posted in Biscuits, Cheesecake, Inspiration, Quickies, Recipes and tagged Biscuits, cheesecakes, coincidence, cream cheese, dodgers, Jammie Dodgers, jammy, mini, quick bake, stawberry, synchronicity by Jacqueline Jay. Bookmark the permalink. I belive, no need to say more! I believe too – that makes us like the lady on the episode just gone doesn’t it! I adore these and will certainly be making them soon. Thank you for the mention! You are most welcome! It was a pleasure to chat. Thank you – they are my favourite! I look forward to seeing those! Nice to hear from you. I had a case of synchronicity fairly recently but unfortunately it was a negative turn of events involving car keys…but that’s another story and it was obviously meant to happen! Yes I love it when it all works out as it was meant to be! With the amoutn you bake I am not surprised you get some failures along the way. They are bound to happen although they always look good to me and I guess we learn something from each one. Hope it gets better. I love it when something is so meant to happen, and you know that I LOVE cheesecakes and mini food so these are pretty much my ideal dessert. Think my girls would love these too. 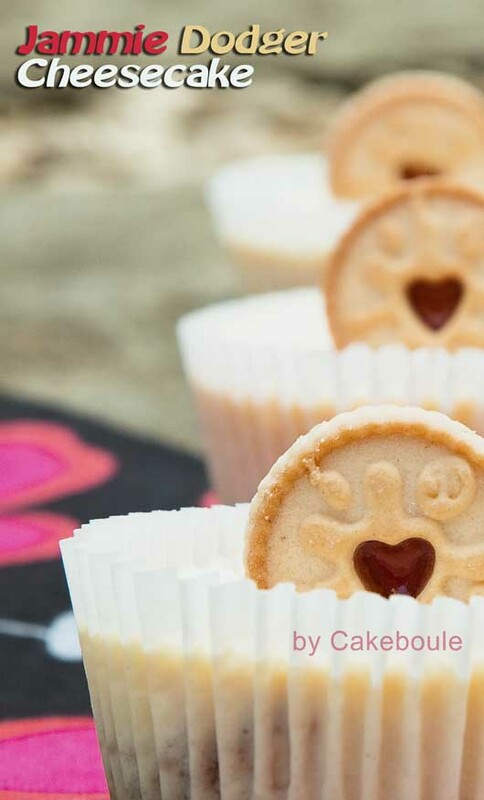 I think your girls would love these too as they are very cute and quite yummy too! I guess if I had put jubille flags in them I could have entered the competition but only just thought of that idea! I love the co incidence of the cream! that is too cool! 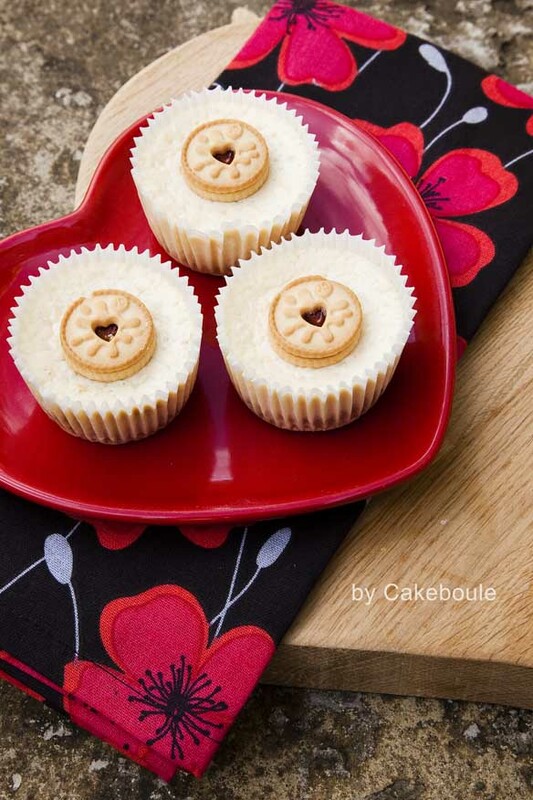 and these are super cute, especially the jammy dodger as the cheesecake base – genius! and what is that giant jammy dodger tin like object in the picture? it’s awesome! I know I was amazed when I weighed it! 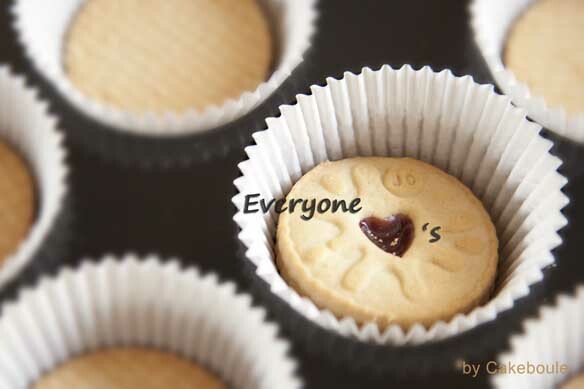 Yes you spotted my jammie dodger tin – it’s from M&S of all placews! I’d been waiting to use it a a shoot. Yes it is certainly there is you listen to it! 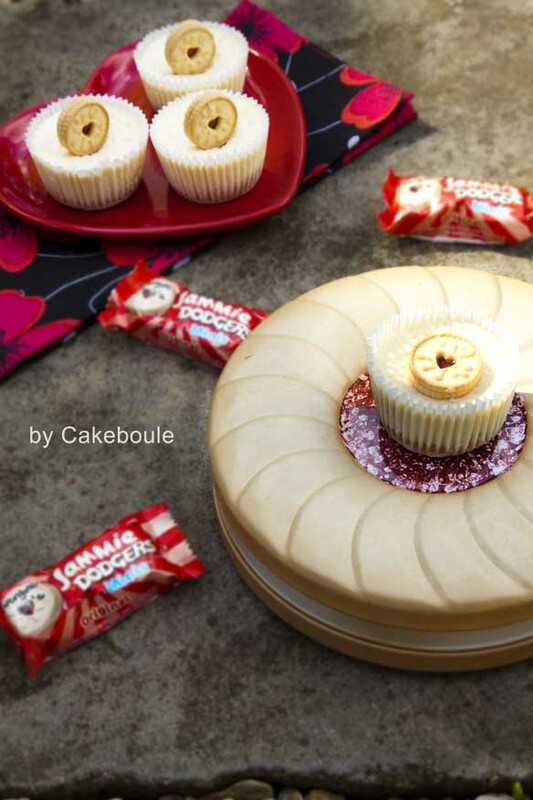 WOW these look great 😉 i’ve actually never heard of a Jammie Dodger before! I don’t think we get them here in melbourne 😦 damn but I’m sure i’d be able to find some similar type of cookies and i’ll try your recipe 😉 thanks for sharing! What a fun idea – love the splat on the bottom too. 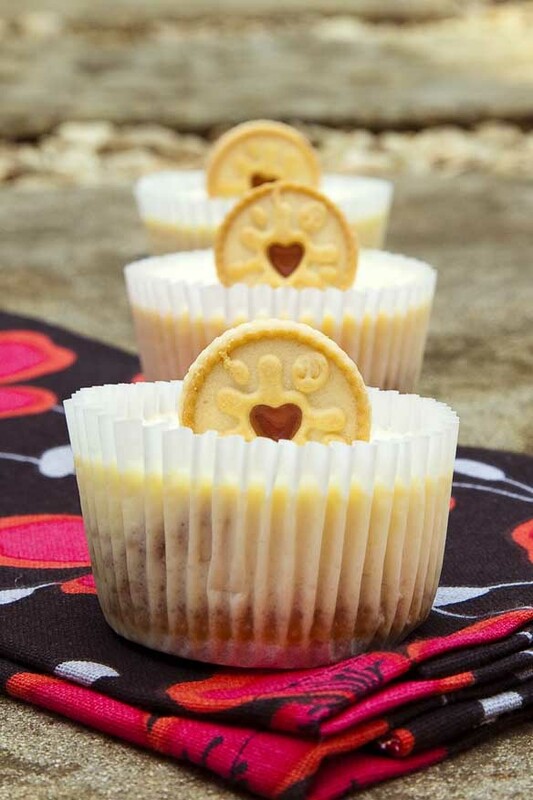 Jammy Dodgers are one of my sinful secrets (no more) so I sort of know that I would love these cheesecakes. What I didn’t know was that they did mini ones. That whole syncronicity things is so weird, when it works it’s brilliant and I have whole days where it does. When it works in reverse, my whole day seems to turn into a disaster. Yes synchronicity is a strange thing but interesting at the same time. 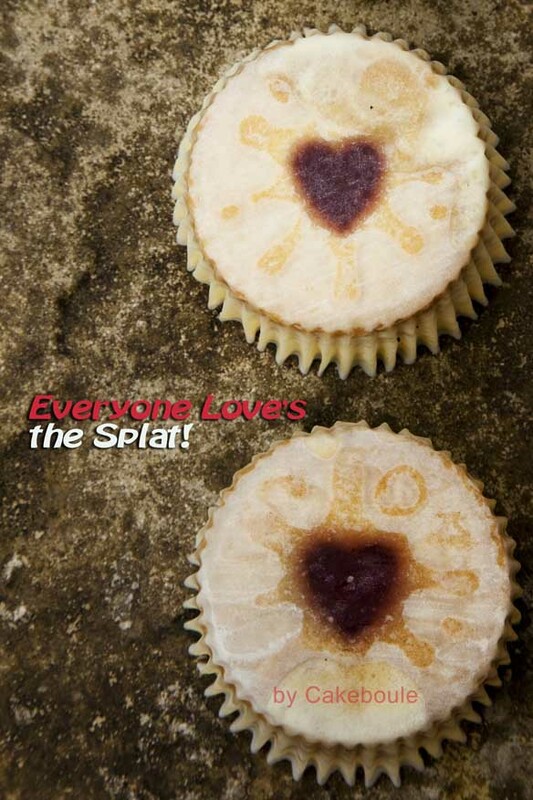 Glad you liked them and the splat was just the best!